At last! 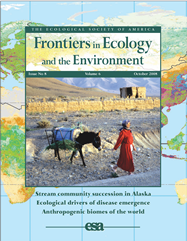 After nearly one year online, my paper with Navin Ramankutty introducing Anthropogenic Biomes (Anthromes), is now in print in the October issue of Frontiers in Ecology and the Environment. Even better, it is on the cover! I wrote this paper in Spring 2007 during my sabbatical at the Carnegie Dept. of Global Ecology at Stanford and at UCSC Environmental Studies (with Steve Gliessman), and I can say with confidence that this paper was more fun to write than any other in my career so far. It all started with my long-running desire to demonstrate to US ecologists, many of whom seem to consider anything related to humans as merely a disturbance to be avoided, just how pervasive and important human-altered (anthropogenic) ecosystems are to ecology as a whole. After my years of studying village ecology in China, this was more than obvious to me, and I suspected, it was obvious to most people on Earth- i.e. most people living in the Old World. So my goal was merely to map the global extent of anthropogenic landscapes, and to show that there was a lot more going on with human/environment interactions than just deforestation, urbanization and agriculture. Thus began a process that has transformed my thinking on ecology as a whole- in both my research and my teaching. In essence, once I started using anthropogenic biomes to describe ecosystems at global scale, I realized that this was actually a good metaphor for all of ecology, at every scale. Can we understand biodiversity and ecosystem functioning today without understanding how humans alter, domesticate and interact with ecosystems and their species? Indeed, ecosystems today are just a part of human systems- along for the ride in a sense. So how do human systems reshapeand interact with ecological systems? What are the types of ecosystems we humans have already created and what are we creating for the future? Today, the reason that trees grow in a place, or not, is mostly up to people. But do we understand the processes that determine whether humans will choose to cut down these trees or instead plant new ones and then maintain them? How do humans influence the biodiversity and evolution of these trees? We humans have already reshaped more than three quarters of Earth’s terrestrial ecosystems and we are here to stay. We need an ecology that helps us understand the ecosystems we have created, the ecosystems that now cover most of Earth’s land. And we need to learn this soon enough to sustain our ecosystems and our species in a form that benefits both us and the rest of life on earth over the long term. The race is on to build a newecology for our anthropogenic biosphere, and it is my sincere hope that anthromes will help along the way.